You are here: Home » MEDIA » Books » Large Hadron Collider 2008 Onwards Owners’ Workshop Manual by Gemma Lavender (book review). 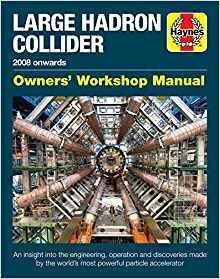 Large Hadron Collider 2008 Onwards Owners’ Workshop Manual by Gemma Lavender (book review). You might think the Large Hadron Collider was a new device but, as Gemma Lavender says in her introduction, its roots go back as far as 1949 when the international organisation CERN was formed to share the finance. CERN stands for the Conseil Européen pour la Recherche Nucéaire Research, essentially research into the atom. Considering the size of a cyclotron, which is what the Collider is, having it spread across four countries signifies how international it is. Originally, 11 countries were involved but now its double that, with the additional countries paying to get in on the research. If you wonder what CERN has done for each and everyone of you reading here, then think the World Wide Web or Internet. It was the pet project of CERN computer scientist Tim Berners-Lee in 1980 who created ENQUIRE as a hypertext format for passing information and later followed up by Robert Cailliau in 1990 into what we have today. I suspect the Internet would have happened from someone sooner or later but it does come from CERN and we owe a big vote of thanks to these gentlemen. Like with the Space Programme, we all benefit from discoveries and inventions along the way so never think it never does anything for us. Seeing the details of how a 2.7km (16.8 miles) ring was built underground to a preciseness of 2mm is a work of engineering. More so with having to use different techniques to deal with different types of rock strata, opening an underwater spring into the tunnel and even finding the remains of a Roman town on the surface which stopped work for a while. The tunnel was built in two parts so there was always work going on. Once the tunnel was made, it was decided to build a monorail to transport people and equipment than for them to walk down there all the time, especially when no lights were available other than the one on your helmet. There are also various access holes to the surface to put the equipment in. A staggering 1,317 electromagnets and 744 dipoles of giant proportions judging by the photographs were installed. There is reference to the American version in Texas, stopped because of funding despite their tunnel being made. As pointed out here, although CERN’s was expensive, every effort was made to be economical with construction. Seeing the size of the various sections of the Collider scaled to the engineers working on it gives a true idea of the scale for such machines used to look for something so small. I say machines because there are three within the complex. Principally, these are ALICE – A Large Ion Collider Experiment, ATLAS – A Toroidal LHC ApparatuS and the CMS – Compact Muon Solenoid. I did find it looked like a strain for them to find acronyms but I don’t think you’ll forget. I suspect their construction not to mention a few of the mishaps that happened along the way is going to be too technical here. However, when you realise the size of the machine and getting it constructed below ground, it’s even more remarkable that it hasn’t had more problems. Although CERN is famous for proving the Higgs boson particle exists, what I didn’t know is three others have also been found, the Z boson, the pentaquark and the doubly heavy-quark baryon. You can read the details in this book. There is a lot of engineering detail in this book and the actual science and use of the Large Hadron Collider is left to the final couple chapters. However, as probably the biggest practical experiment into the nature of matter on our planet, this book must surely draw your attention and you will certainly come away knowing far more about its design and results. « Lawgiver Mk IV Convention, Bristol, Saturday 26 May 2018 (convention report).